TrimTabs Asset Management’s flagship ETF, the TrimTabs All Cap US Free Cash Flow ETF (TTAC), recently celebrated that it had crossed the $100 mln AUM level. However, this is not the first time that TrimTabs has sponsored an ETF that has attained this level of success. TTAC is an actively managed ETF built around independent research firm TrimTabs Investment Research’s expertise in selecting companies that have generated strong free cash flow growth, improving balance sheets, and reducing their share count. The fund looks to generate long-term returns in excess of the Russell 3000. Since going live TTAC on September 27, 2016, TTAC has generated cumulative returns of 49.78% (through August 8, 2018), compared to a 37.40% cumulative returns for the Russell 3000 over that same time frame. TTAC’s 1-Year returns were 21.25% as of June 30th, 2018 compared to the Russell 3000 gain of 14.78%. As of August 8, 2018, TTAC has gathered $105.1 mln in AUM – a significant gain from the $38.0 mln in AUM in the fund as of the beginning of the year. TrimTabs Asset Management (TTAM) was founded in 2008 by TrimTabs’ Charles Biderman, as an effort to leverage the 30 years of research expertise he had built up at TrimTabs Investment Research. 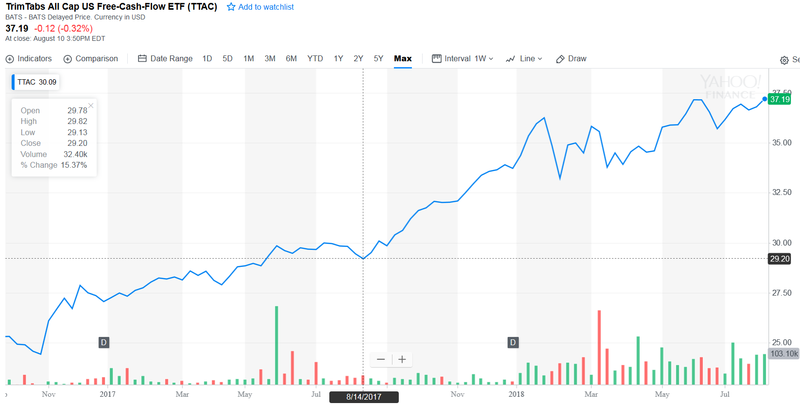 The early success of TTAC should not come as much of a surprise as TTAM was previously a sub-advisor for AdvisorShare’s successful TrimTabs Float Shrink ETF (TTFS). This fund had earned a coveted five-star rating from Morningstar and had delivered annualized returns of 19.22% from inception on October 24, 2011 through of March 31, 2016. In fact, AdvisorShares had gathered $250 mln in the fund, before assets dropped to $177 mln by June of 2016. Despite the apparent success of TTFS, AdvisorShares decided to switch sub-advisors from TrimTabs to Wilshire Associates, when the fund was renamed the AdvisorShares Wilshire Buyback ETF effective July 1, 2016. In an effort to salvage some of its client relationships, TrimTabs Asset Management responded to this change by offering their Float Shrink strategy in a separately managed account (SMA) format with a lower minimum investment and lower fees to accommodate its clients. As we have mentioned in the past, a number of independent research firms have tried to diversify their revenues by building investment products based on their research. However, this effort does not come without risks. It has taken close to two years since AdvisorShares’ switched sub-advisors for TTFS. However, TrimTabs has actually been able to resurrect their ETF efforts. The good news is that TrimTabs Asset Management has been able to generate strong performance with their new ETF. Unfortunately, TTAM has taken quite a haircut during this process. TTAC is only now hitting $105.1 mln in AUM – a far cry from the $250 mln TTFS hit at its peak and even significantly lower than the $177 mln TTFS had fallen to when AdvisorShares switched sub-advisors. In addition, the expense ratio for TTAC is .59% — much lower than the .99% charged on TTFS at its peak. It must be noted that TrimTabs was probably receiving no more than .5% on TTFS, with AdvisorShares earning the remainder. Based on our analysis, TTAM is probably generating $620,000 in gross revenue currently on TTAC which is significantly less than the $900,000 or more they were earning on TTFS. However, TrimTabs is likely earning even less than this as they are directly paying for marketing and distribution, as well as other operations costs for managing the ETF out of this total. Despite this, we suspect that TrimTabs management is overjoyed that TTAC is performing well; is gaining traction with customers; and, that they are in complete control of TTAC and not subject to the whims of a partner.